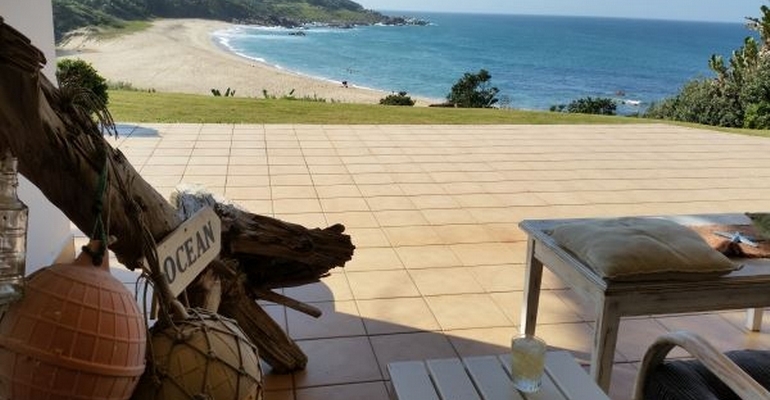 Dolphin Bay Beach House is situated on the edge of the ocean overlooking the bay, lagoon and beach, combined to form a spectacular view unmatched on the South Coast. Stroll across the lawn, through the gate and you're on the beach. The home is a 12 sleeper and consists of 5 bedrooms of which two are en-suite, three of the bedrooms have queen sized beds, one bedroom has two three quarter beds, and one large bedroom has four single beds. There are two additional bathrooms and one guest toilet. The open plan lounge, dining room and entertaining areas flow out to the patio's on both sides of the house. There is a large upstairs wooden deck as well as an extra large downstairs semi undercover patio and walled off braai area. The beach house has an excellent security system manned by a 24 hour armed response, the property is fully walled at the rear with double garage, remote controlled door and driveway gate. The garage adjoins the house and is accessible through the kitchen area. This home is truly a one of a kind with a view to die for, once you have arrived you will never want to leave.